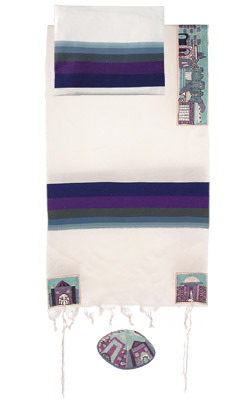 Jerusalem - in Blue - Tallit Hand Embroidered Atara and Corners CAT# THE- 2. size: 61” X 75”. made of hand – woven cotton. The motifs are hand – embroidered on a separate piece of raw cotton fabric using various colors of silk, gold and silver threads. Sizes of talletot vary greatly. The silk and synthetic ones vary in size, for men, from about 36 ª 54 inches (91 ª 137 cm) to 72 ª 96 inches (183 ª 244 cm). The woolen tallit is proportionately larger (sometimes reaching to the ankle), conforming to the Halakha that the tallit should be large enough to be full-body apparel and not just scarf-like. A ribbon, or a band artistically woven with silver or gold threads (called "spania"), and about 24 inches (61 cm) long by 2 to 6 inches (5 to 15 cm) wide, may be sewn on the side of the tallit that is nearest to the head, and is called the atarah.